A rectangular board is standing upright on a table. 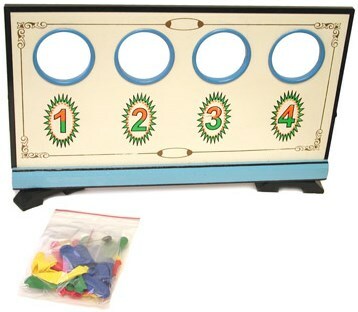 In the board there are four large holes in which small inflated balloons of different colors are lodged. The performer declares that he has pasted a prediction label on the rear side of the board just under the colored balloons, which he wishes to save. The prediction label has a bold white arrow on a colored background. Any three spectators then choose a balloon color. They are free choices no color is forced. As each color is called the performer bursts the balloon with that color using either a pointed rod or a lit cigarette. In the end only the balloon that nobody has nominated remains. The performer (without any clumsy moves) turns the board around to show the label (with a white arrow on a colored background that matches with the color of the balloon) fixed to the back, just under the unharmed balloon.